Sheltered under a tatty umbrella, my colleague Victoria and I stand silently in a downpour watching a burly man called Tom shuffle slowly around a blue Ford Fiesta Zetec. Each few seconds, he crouches down to peer at the bodywork and take notes — though the rain quickly smudges them. Tom, who works for national vehicle dealer WeBuyAnyCar, occasionally grunts, then points at the bonnet. ‘So, what happened here, then?’ he asks. He bends down and gestures towards a barely visible scuff on two of the wheel rims. ‘That’s where you’ve gone up against the kerb — it’ll be fine, but it’ll need repairing,’ says Tom. It seems to me that Tom is hamming it up, but that may be part of the plan. Because Money Mail has recently heard from a number of readers angered by the inspection process that vehicles are put through when sold to WeBuyAnyCar, which boasts of being Britain’s favourite car-buying service. It works like this: if you want to sell your car, you go to its website, type in the registration number, plus a few details, including mileage and service history, and you are offered a guaranteed price. You then take the car to one of the firm’s lots. There, an engineer will inspect your vehicle before offering you a final price — which will typically be lower than the so-called guaranteed price. This is where readers have fallen out with the firm. ‘If the car is as you say it is online, then we guarantee to offer you the price we quote online’ says the company’s website. But readers say hundreds of pounds are being knocked off the online price for tenuous reasons, making the guarantee worthless. Last month, Tanya Carley received an online guarantee of £475 for her 12-year-old Renault Clio. But at her local branch in Hornsey, North London, she was told she’d only get £306. In October, Tony Tungate, of Norfolk, was offered £7,900 for his four-year-old Skoda — £850 less than the online guarantee. He says: ‘They said there were stone chips on the bonnet — hardly surprising for a four-year-old car. After giving the car details, we were offered a guaranteed price of £3,949 for Victoria’s six-year-old Ford Fiesta. With just one previous owner, it’s only done 30,000 miles — a very low mileage. Also, it was serviced in January. Tom’s inspection is over in seconds, and he announces a test drive. He squeezes into the front seat and starts the car. He slowly rolls the car back as if to start a turning manoeuvre — then stops. ‘That’ll do, it works!’ he says, jumping back out. On used-car websites, Ford Fiestas with twice as many miles on the clock go for £3,900. The valuation specialist Parker’s suggests that an independent dealer could offer up to £4,235. We’re in Tom’s office and he’s ready to talk us down from our guaranteed price. The service history isn’t exactly as he thought it was, he says. He then says: ‘How much do you think it’s going to cost to repair the dent?’ I guess £80 to £100. Tom grins. ‘It’s a lot more than that,’ he says, looking us squarely in the eye. His jaw juts out as he turns to jab more numbers into his computer. Finally, he gives us a price — £3,611.61 — nearly 10 per cent less than the original quote. We express disappointment and mention the higher prices from our research. He won’t budge — that’s his best deal. Victoria suggests we go to a cafe to talk over his offer — and come back to tell him what we decide. This seems absurd but, he says, it is standard procedure. Since its 2006 launch, WeBuyAnyCar has grown from one office in Surrey to a nationwide network of 200-plus dealers. It has bought some 750,000 cars; in 2014, its turnover nudged £557 million. Parent company BCA, formerly British Car Auctions, was floated on the stock market this year and is worth about £1 billion. However, a 2011 probe into WeBuyAnyCar by the then Office Of Fair Trading found ‘a lack of transparency dealing with customers’. Some 96 per cent of those who sold to the firm got less than the original online valuation, it discovered. The investigation also found inspectors were set purchase price targets; this included lowering the online valuation by up to 25 per cent. The company insists its poor past behaviour has been eradicated. A WeBuyAnyCar spokesman says: ‘We use sophisticated valuation software to reach a fair price on a vehicle, and we offer a guarantee that, if the car is as you describe it, we will buy it at that value. 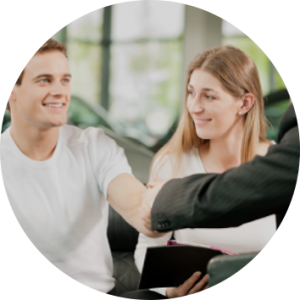 ‘If an initial offer has to be reduced when we see the car, it may be because the seller has missed something or forgotten to tell us about a fault. Even then, we will honour the valuation if the seller rectifies any issues and brings the vehicle back within seven days. Sell my car. A firm cash offer in just hours, no hidden fees. We collect nationwide and pay directly to your Bank the day we collect. Coypright ©2019 We Buy Cars Direct, All rights reserved · Crafted by The Northern Foundry.